A recent report demonstrated that consumers may have a difficult time navigating the data that is available to help them make decisions about safe hospital choices. 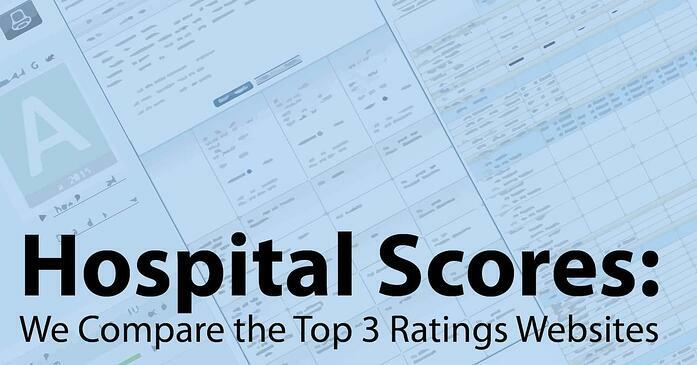 Today we are going to explore 3 popular hospital ranking sites and see how they compare in the same scenario. We are going to put ourselves in the place of a prospective patient undergoing surgery trying to find a hospital in Richmond, Virginia with the lowest infection rates. Let’s see which hospital stands out, and whether all 3 sites agree! The Leapfrog Group is a nonprofit organization whose mission is to provide greater transparency in U.S. healthcare. One of their most significant products is hospitalsafetyscore.org, the website that houses the hospital scores as well as patient advocacy materials. Right from the front page I can quickly type in my search request, in this case Richmond, VA. My search results in 11 hospitals, and I’m given their name, address, and a "Fall 2015" letter grade (like in school, A-F). Three of the hospitals have Bs, the rest have As. I can see them on a map also, where their place markers are their letter grades. Sorting them by grade received, Bon Secours Memorial Regional Medical Center comes in first, so I’ll look deeper into their score to learn about their infection rates. However, there is no way to tell if the first hospital in the list is acutally the top performer within the hospitals with A scores. Looking at their “Infections and Safety Problems” score report in depth, I see that this hospital is performing above average across the board in infections. Since I’m considering a hospital for a surgery, I’ll also look at their surgery problems. Unfortunately, this hospital is performing below average in some areas, issues I can bring up with my doctor. Hopping back to the search results, I perform the same steps to look at the next few hospitals’ infection rates and surgery stats, and now have a list of hospitals I would like to discuss with my doctor. CMS is a part of the US Department of Health and Human Services. It administers Medicare, Medicaid, the Children’s Health Insurance Program, and the Health Insurance Marketplace. This central office collects data from all its certified hospitals each year. First of all, simply Googling “hospital compare” gets you to CMS’ description of their Hospital Compare website, not the website itself. After a few clicks within their site, you can get to the actual Hospital Compare page (hyperlinked above for your convenience). I put in my city and state and begin my search. My results are 12 hospitals within 50 miles of the city center, and I can pick any three to compare side-to-side. I can only sort on location and type of hospital, not by performance. I’ll select the first three and start comparing infection rates, or in their term, “Complications”. Expanding the “Healthcare associated infections” tab, I can now compare the three hospitals. I read how my selected hospitals rate as compared to the National Benchmark. I can now also add one or more of these hospitals to my “Favorites,” but in this case, I’ll look at their results in surgical complications. (I’ll spare you the very long screencap.) This data now includes the actual National Benchmark rates. I can see the data in graph form by clicking a button, but just for one line of data at a time. The next step would be to repeat this comparison with other hospitals in Richmond, VA, until I have a list to discuss with my doctor. Cons: All text and numbers make scanning and digesting information more difficult. A user would need to take notes or print out results in order to stay on top of all the data presented. Consumer Reports is a for-profit company that tests and rates products and services, including consumer goods, technology, and hospitals. Access to their ratings is available to paying subscribers. A Google search brings you to the main Hospitals page under the Consumer Reports website, but starting from the Consumer Reports page requires a few clicks. Once there, the first step is selecting a state from the map or lists below it. A narrowed search to Richmond, VA results in 5 hospitals listed in a table comparing their "Safety Score" and how well they avoid infections, readmissions, C-sections, and adverse surgery events. Right away I can see that Bon Secours Richmond has the highest safety score, followed by Bon Secours St. Mary’s. I can compare up to five hospitals so I select them all. In one large table I can now compare the five hospital’s general information, safety score, and more detailed scores on patient outcomes, adverse surgical events, readmissions, patient experience, hospital practices, and heart surgery. I’m looking at infection, so I scan to see they are included under “Patient Outcomes.” From here I can see some variation in scores, from above average to below average, all represented with the circle icons used throughout the Consumer Reports materials. I would need to talk to my doctor to see how each of these areas applies to my case, but glancing at this data, I would want to find out more about Bon Secours Richmond before making that my top choice. I can easily navigate to its separate ratings page where I can see more details (a lot more details, so no screencap for this one either.) I can now repeat my comparisons with other hospitals in neighboring areas in order to get more choices. Pros: Quick overall score easy to see and understand, I can click on buttons that pop up explanations of terms and data, the score icons are easy to understand, and I can compare hospitals side-by-side. Cons: The search parameters don’t make searching in a wider geographic area very easy (and the scroll windows are cumbersome), much of the data shows as “not yet rated." After my experiences on the three sites, I’m left with no clear winner. I have more information, but in order to make a decision, I would need to talk to my doctor about what ratings apply best to my situation. I would then want to look back at these sites to get a more complete picture. At this point, I would most likely use all three sites in conjunction to make my decision. After this experiment, we are left with more questions than answers. In future posts, we will explore how these ratings sites come up with their scores, what medical professionals think about these scores and how to use them, and a guide to help you best use the tools for yourself or a loved one.